The opening ceremony kicked off the 2016 Olympic Games in Rio de Janeiro, Brazil, where more than 11,000 athletes will spend the next two weeks competing for the coveted gold medals — and more of them are related than you might imagine. So which Olympic athletes are siblings? From swimming to rugby, pentathlons, sailing, and marathons, here are some of the Olympian brothers and sisters to watch out for. The Esposito siblings, who hail from Sydney, will fence, swim, shoot, run, and show jump for the modern pentathlon event in Rio de Janeiro. Chloe, 23, and Max, 17, are coached by their father, Daniel Esposito. Daniel competed for Australia in the 1984 Los Angeles games, making the pentathlon (a sport that's still relatively unknown in many countries) a family passion. Three-time World Champion Will Ryan has been a huge influence on his younger sister's career, according to Jaime herself. "He’s been on the circuit for a few years more than me, and has been such a huge help in every part of my sailing over the years, there is no way I would be at this stage without him," she said in an interview. This is the first Olympic Games for both Will and Jaime Ryan. The Rodionova sisters were flown to Rio just a few days before the Games began to take the place of another team who withdrew from the women's doubles event. This is the second Olympics appearance for Anastasia, 34, but the first for Arina, 26. Jared Tallent, the 2012 Olympic champion in the 50 km event, will be competing in the 2016 Games as well — but this time, he's bringing his sister along. Jared coaches Rachel, 23, who will make her Olympic debut this summer after a strong year in the racewalking world. Racewalking, by the way, is a track and field event that requires the competitor's foot to be on the ground at all times. The hyper-disciplined Marton sisters told Vogue Australia that, because they compete in a sport with weight categories, they plan out every part of what they eat and how much they train. The two practice every day by sparring against each other, according to Carmen. “...this has been their dream for so long and it’s come true. It almost seems unbelievable that I’ve got two daughters who have just stood on the top of the podium at the Olympic Games, doing what they used to talk about doing 15 (or) 16 years ago as young swimmers. That is just unbelievably special. It’s just like the perfect ending." At 18, Josh Katz is the youngest judoka to ever compete in the Olympic Games. However, his 21-year-old brother Nathan's record is no less impressive: both brothers are in the top 22 of their respective weight divisions, which is what allowed them spots on the Australian team. Talent at judo seems to run in the Katz family: the brothers' mother, Kerrye, competed in the 1988 Seoul games, where their father was a judo coach. Older brother David competed in the 2012 London Games, but this is younger sister Emma's Olympic debut. She's already nabbed a gold medal, though, along with the Campbell sisters — the three of them, alongside fourth team member Brittany Elmslie, scored a win in the freestyle relay event. Lucas and Moises represent part of the "rugby sevens' seven siblings," the informal nickname for the seven pairs of siblings competing in the rugby sevens event. They both play for the same club team, Sao Jose. Like the Duque brothers, Felipe and Daniel Sancery are also part of the rugby sevens' seven siblings. What sets the Sancery sibs apart? They're twins, not just brothers, and they both play for SC Albi. Nicole, 21, and Sharon, 23, will be competing in their first Olympic games when they face off against Fiji, Australia, and the United States. Fernando, 21, and Juliana, 25, are veritable speed demons. They're both known for their racing abilities, and Fernando in particular is famous for passing his opponents without losing steam. NBC named him one of its "Latin American Athletes to Watch at the 2016 Rio Olympics." The history-making "Trio to Rio" is comprised of Estonian identical triplets Leila, Liina, and Lily. The Luik triplets, who are 30, transitioned from professional dancing to marathon running six years ago. Olympic historians are "99.9 percent sure" that this is the first time a set of triplets has competed at the Olympic Games. Injera and Kayange are famous as some of the best rugby players to hail from Kenya, but they're not just top athletes. Kayange (pictured above), who is the older brother at 34, is also an organic chemist. Injera, 29, has studied mass communications. These rugby-playing brother are members of the same club team, the Blues. Akira, 21, and Rieko, 19, are the sons of two other rugby players: their mother, Sandra Wihongi, played for the New Zealand Black Ferns, while their father, Eddie Ioane, played for Samoa at the 1991 Rugby World Cup. Sonny Bill Williams currently plays rugby sevens for the New Zealand national team, making him one of the rugby sevens' seven siblings. His younger sister, Niall (known as "Nizzle"), has played rugby for over a decade, making both Williams siblings tough and experienced players. In addition to playing rugby, Sonny Bill is also a heavyweight boxer, while Niall is a mother of two. These Catalan siblings rep Spain in the rugby sevens' seven siblings. Bárbara, 33, and Pol, 23, have a third sibling, Julia, who also plays rugby. She didn't qualify this year, but Bárbara and Julia frequently play together. Becky, 24, first competed at the 2006 Commonwealth Games, and is a seasoned pro in the gymnastics world at this point. Her younger sister, 17-year-old Ellie, is making her first appearance at the Olympic Games. Although the two are seven years apart, they look practically identical. In 2012, older brother Alistair, 28, took home a gold medal, while Jonny, 26, nabbed bronze. This year, they're hoping for a one-two, or a gold-silver medal combo. This sibling act works much closer than most of the pairs on this list. Andy Murray, the famous British tennis champ, and his brother Jamie play doubles, and they're going for gold for the third time after losses in 2012 and 2008. The Chambers brothers, who hail from Northern Ireland, are competing in different events: older brother Richard will participate in the lightweight double sculls, while Peter will compete in the lightweight four. John Whitaker, 61, and Michael Whitaker, 56, are some of the most experienced Olympians competing in any event. Between the two of them, they have 10 Olympic appearances, and they'll be joined at the 2016 Games by their horses, Ornellaia and Cassionato. These Scottish brothers make up two-thirds of the British men's marathon team, alongside Tsegai Tewelde. At 26, Derek is the older Hawkins, while Callum, 23, is the younger sibling. Makenzie, 19, and Aria, 17, are two of the youngest Americans competing at the 2016 Games. Since water polo is a team sport, they play together, and Makenzie joked to NBC that they have to "leave it all in the pool" after practice so they can keep their sister act strong. Kelley, 27, and Courtney, 25, have never competed against each other before, but since they both qualified for the women's epee fencing individual event, that will change this August. The Hurley sisters also qualified for the team event — not surprising, since they're ranked first (Courtney) and second (Kelley) in the national senior team point standings. This is the third Olympic games for older sister Margaux, 24, but the first for Isabella, 22. Isabella is married to Amro Elgeziry, an Egyptian pentathlete who competed in the 2008 and 2012 Olympics. The American women's field hockey team finished last in 2012, but it's already shot to the top in the 2016 Games by defeating Argentina — partially due to great performances by the Reinprecht duo. Both graduated from Princeton: Katie in 2013, Julia in 2014. Not all siblings who compete in the same sport are good friends, but Erik and Kawika Shoji consider themselves best friends. The Shojis, who are from Honolulu, have played professionally together in Berlin and will now be joining forces again in Rio de Janeiro. If you recognize any of the sibling pairs on this list, it's probably the powerhouse duo of Venus and Serena Williams. 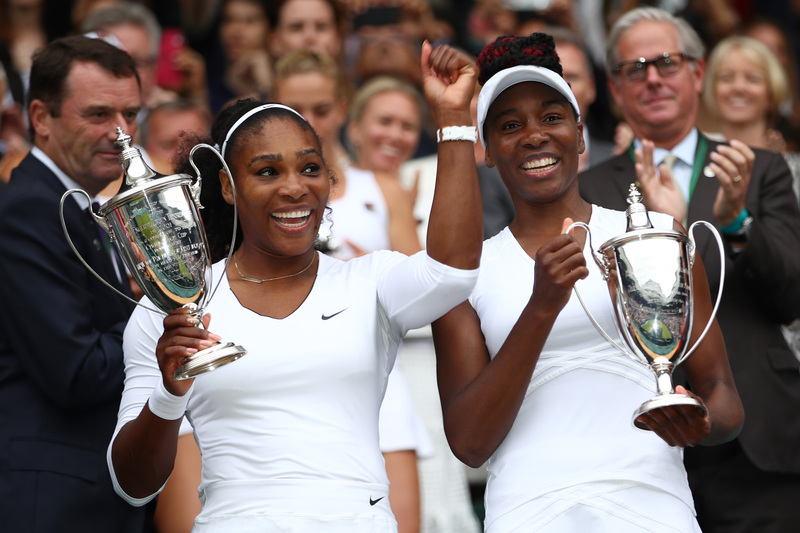 The Williams sisters have more gold medals (from 2000, 2008, and 2012) than any other doubles tennis team in history, and they're heavy favorites to win this time, too. Plenty of the brothers and sisters competing in the 2016 Games look like they could be twins, but Bob and Mike Bryan actually are. They've won every Grand Slam event at least twice, and, like the Williams sisters, they're favored to take home a gold medal this summer.